I'll admit it. Before I was a theater geek, I was a TV geek. I grew up watching TV, and my best friends were characters on TV shows. I'm still a TV geek, and I still consider TV characters* my friends. So when I heard that an actor from two of my favorite current shows was doing a play in Minneapolis, I didn't even care what or where the play was. I was going to see Rebecca Bunch's mother / Deanna (who's Deanna?) no matter what. 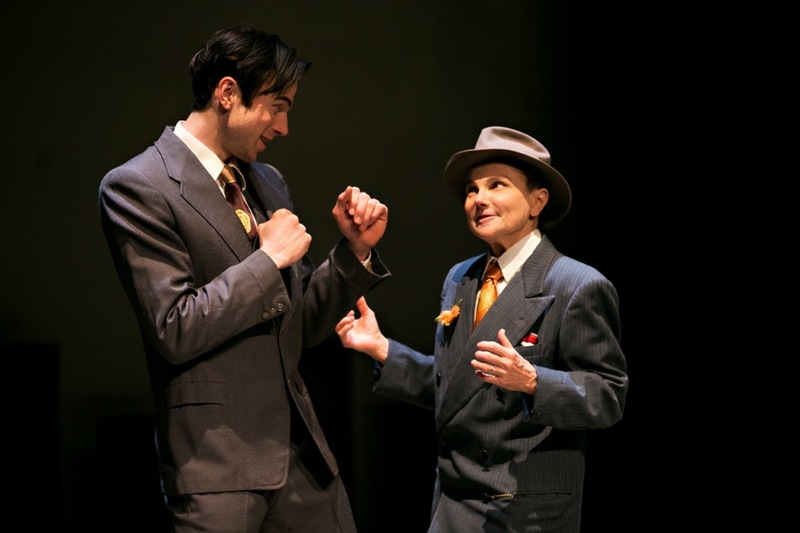 As it turns out, Tovah Feldshuh has some ties to the #TCTheater community, having studied and worked at the University of Minnesota and the Guthrie back in the day. 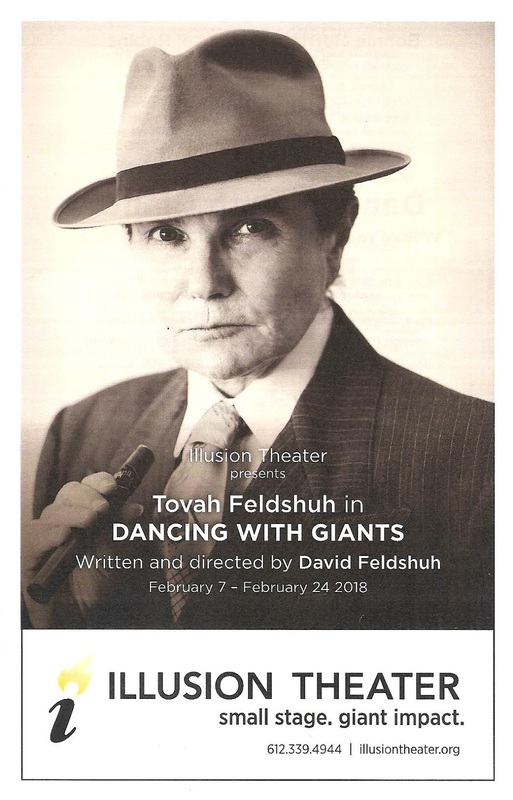 Her brother, playwright/director David Feldshuh, has an even deeper connection, specifically with Illusion Theater, which is premiering his new play Dancing with Giants. I'm happy to report that not only is Tovah a delight live on stage, but this is also an entertaining, educational, funny, and sobering play. It's obviously a labor of love for the Feldshuh family, and Minneapolis/St. Paul theater-goers are lucky to be able to experience it first. 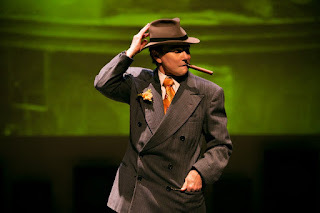 Dancing with Giants is based on the true story of the friendship between German boxing champion Max Schmeling and his Jewish American manager Yussel "the Muscle" Jacobs in the 1930s. One of Max's biggest rivalries was with African American heavyweight champion Joe Louis. His win against Louis made him a favorite of the Nazi party, including Hitler's right hand man Joseph Goebbels, and his subsequent loss made him an outcast. A bit of an enigma, Max was a proud German who was used by the Nazi party in their propaganda. But he also refused to fire his Jewish manager, and became lifelong friends with Louis, even paying for his funeral. It's a situation and a foursome of historical characters rife with drama. This play is a fascinating exploration of these events and this era in history. In what perhaps is a bit of nepotism, and definitely more than a bit of genius casting, Tovah Feldshuh plays Yussel, a character 20 years younger and of a different gender. But why not? It's a great and fun part, and she's an absolute delight. Without her, it would be just four dudes on stage, which is tough to stomach these days. Tovah brings a bit of feminine energy to the role, to the stage, but regardless of age or gender, she really brings this eccentric character to life, literally and figuratively light on her feet as she dances her way through this performance. Yussel was quite a character, a hustler and a charmer, and Tovah, despite her tiny frame, makes him larger than life. The rest of this strong four-person cast are local to the Twin Cities. Sam Bardwell fills the role of the strong stoic German boxer well, his fair hair dyed a dark brown (an important plot point, as Max Schmeling didn't "look Aryan"). He and Tovah have a believable friendship chemistry onstage as the unlikely duo. Ricky Morisseau's Joe Louis doesn't appear until the second act, in a warm and personable depiction of the champion fighter. Last but not least, James Cunningham embodies one of the most despicable figures in all of history, Joseph Goebbels, and makes him both sinister and charming, as Yussel and Goebbels do the delicate dance of negotiation. The stage is mostly bare, lined with radios which were a chief tool of Nazi propaganda, and the means by which people followed sports in the age before television. Projections (designed by Jon Carlson and Michael Robins) of historical photos are well used, giving us a real sense of who these people were. Boxing scenes often play out in pantomime in front of actual photos, which anchors the events in history. The title of the play comes from Yussel's line that he can dance with giants without getting hurt. Literally, he loves to go dancing at the Savoy, and figuratively, he goes up against Goebbels and longs to meet "the mad monkey of Berlin" just to see what would happen. Tovah brings dance into every scene, every moment, adding personality to the character (movement choreography by my favorite dancing couple, Megan McClellan and Brian Sostek, who know a thing or two about historical dancing boxing stories). The intersection of sports and politics is an interesting one, and incredibly timely, with the protests happening in American sports, and an Olympics that's taking place in South Korea, in which Russia is not allowed to compete. Can sports ever be just a friendly game of athletics, completely devoid of politics? Should it be? Like theater, sports exists in the world, and therefore it has parallels to and commentary on the world, whether we want it to or not. Like Yussel and Max, sports can bring nations together, but sports can also be symbolic of larger conflicts. And even though the play has been in development for three years, the exploration of the rise of fascism and the use of media to manipulate people rings eerily true today. The director notes in the playbill (which has lots of great historical information), "I don't believe that plays should spout messages. I do believe that stories well told, authentic and engaging, can offer insight that may help us understand our present moment." Mission accomplished. Dancing with Giants plays on the Illusion Theater stage on the 8th floor of the Hennepin Center for the Arts on Hennepin Avenue in downtown Minneapolis through February 24 only. More info can be found and tickets purchased here. *It's a good time for seeing TV characters live on #TCTheater stages. Richard Thomas, aka The Walton's John Boy, is starring in the Broadway tour of the Tony Award-winning play The Humans, arriving on Hennepin Avenue on Tuesday!